Have you ever found yourself struggling to get your order taken at a crowded bar or lunch counter, only to walk away in disgust as more aggressive customers elbow their way to the front? It turns out that flies do much the same thing, according to biologists from the California Institute of Technology (Caltech). Reporting in the advance online edition of the journal Nature, the scientists say they have identified an aggression-promoting pheromone that controls such behaviors, and have pinpointed the neurons in the fly's antenna that detect this pheromone and relay the information to the brain to elicit aggression. Their results provide an important first step toward unraveling the mystery of how aggression—an innate (unlearned) behavior—is hardwired into the brain by an animal's genes. Pheromones—specific chemicals used by a particular species to communicate and to control their behavior—have been identified in the scent glands of other insect species, such as ants and beetles, and have been shown to elicit aggressive behavior when presented in synthetic form to the insects. It has been difficult, however, to prove that the insects normally use these pheromones to control their aggressive behavior, notes study coauthor David Anderson, Caltech's Seymour Benzer Professor of Biology and a Howard Hughes Medical Institute investigator. "Obtaining such proof required the ability to experimentally interfere with the insects' capacity to sense the pheromone," he explains. "And that, in turn, necessitated identification of the receptor molecules that detect aggression pheromones, and of the olfactory sensory neurons that express these receptors." As it turns out, the only insect in which these conditions could be met was the vinegar fly, Drosophila melanogaster, explains Liming Wang, a graduate student in Anderson's lab and the Nature paper's first author. "The genetic/molecular architecture of the olfactory system in Drosophila is well understood," Wang explains. "Thus, one can easily test whether a specific olfactory receptor, and the sensory neurons expressing it, are involved in a given behavior." Wang discovered that 11-cis-vaccenylacetate (cVA)—a pheromone present in the male fly's cuticle—"robustly promotes aggression in pairs of male flies," Anderson says. Aggressive behavior in Drosophila consists of brief "lunges" in which one fly rears up on its hind legs and snaps down with its forelegs on its opponent. When Wang and Anderson added synthetic cVA to an "arena" in which combatant flies were tested, the frequency of lunges was dramatically increased. Building upon earlier work from other laboratories that had identified the receptors for this pheromone, Wang next showed that silencing the neurons in the fly's antenna that contain these specific receptors could block the ability of synthetic cVA to promote aggression. These findings allowed Wang and Anderson to test whether flies can actually detect the release of this pheromone from other flies—and whether such detection promotes aggression. To do this test, they trapped between 20 and 100 "donor" male flies—so called because they "donate" the volatile pheromones into the surrounding environment—in a tiny cage surrounded by a fine mesh screen. The screen allowed pheromones to escape, but kept the donor flies inside. The researchers then measured the effect these donor flies had on the aggressiveness of a pair of "tester" male flies placed on top of the cage. The tester flies were close enough to sense the pheromone, but were prevented from coming into contact with the donor males by the mesh screen. "Remarkably," says Anderson, "the presence of the caged donor flies strongly increased aggression between the tester flies, and this aggression-promoting effect increased with a higher number of donor male flies." Most importantly, the effect of the donor flies on the aggressiveness of the tester flies could be blocked by inactivating, in the tester flies' antennae, the neurons that sense the aggression pheromone. "These experiments suggested that the presence of high densities of male flies in a local environment can indeed promote aggression through their release of cVA and its detection by other flies," Wang explains. Based on these findings, Wang and Anderson began to speculate whether this pheromone might play a role in limiting the population density of male flies in a given environment. Normally, male flies are attracted to food in order to feed and because it gives them the opportunity to mate with feeding female flies. If the density of male flies on a food resource is too high, however, the competition between the flies might prevent feeding and mating. 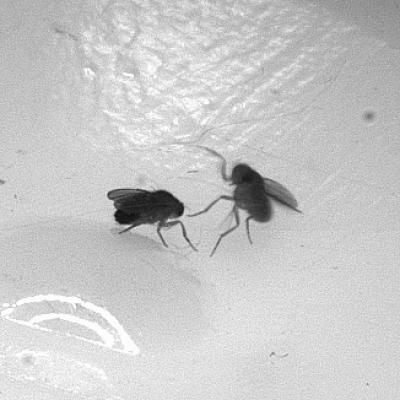 Since aggressive flies tend to chase away their competitors, an aggression-promoting pheromone should tend to keep the density of flies from becoming too high. Wang tested this hypothesis by allowing a small number of flies to compete for a limited supply of food, while genetically manipulating their cVA-receptor neurons to make those neurons hyperactive. Surprisingly, says Anderson, the flies with the hyperactive neurons quickly dispersed, leaving the food resource behind. "They fought one another until a dominant fly became 'king of the hill' and drove the other flies away," he explains. "In contrast," Anderson adds, "flies whose genes weren't manipulated in this way ate happily together, like cows grazing placidly on an alpine meadow." According to Wang and Anderson, these results suggest that when the population of male flies reaches a high-enough density, the concentration of cVA rises to a level that promotes aggression, forcing some of the flies off the food. The departure of those flies causes the ambient concentration of the pheromone to decrease, thereby decreasing aggression. "Once this occurs," says Wang, "the population becomes stabilized at an optimal density until more flies become attracted to the food, and the cycle repeats itself." Although their observations of this behavior were made under artificial laboratory conditions, the researchers believe that it should be possible to test their hypothesis in the wild. The discovery of the fly's response to an aggression pheromone raises a number of intriguing questions, such as whether this fly pheromone might be sensed by humans. This is very unlikely, says Anderson, as pheromones have evolved as a "private" chemical communication channel within a given species. But that does not mean humans lack aggression pheromones altogether, he notes. After all, aggression-promoting pheromones have been discovered in mice, which are evolutionarily closer to humans than flies. It is possible, therefore, that humans have their own aggression-promoting pheromones. "Do these pheromones keep the lines from getting too long at a crowded lunch counter, as irate patrons jockey for position in the queue and some walk away in frustration?" Anderson asks. "Only time will tell."